The 9th Annual James Gamble Rogers Colloquium on Historic Preservation will take place Saturday, May 16. 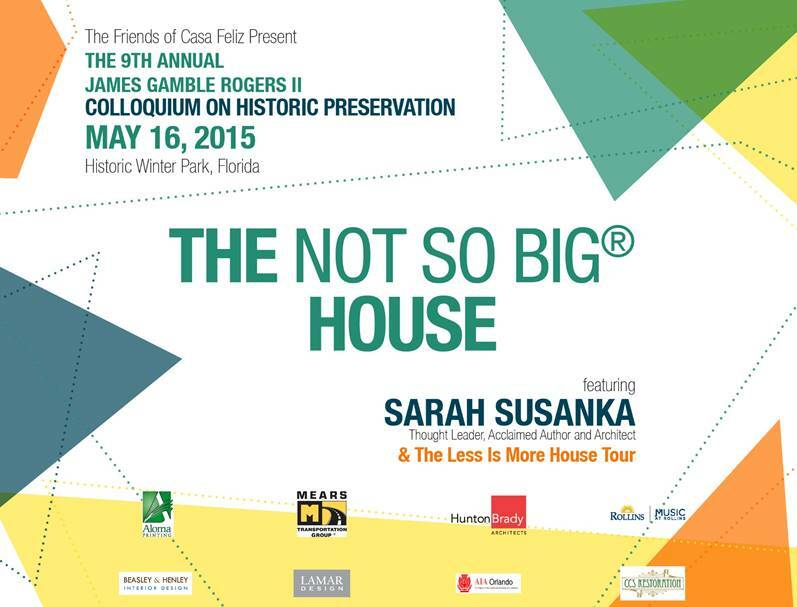 This year’s keynote speaker, Sarah Susanka, is entertaining and dynamic, and the message of “The Not So Big House” is not only useful for those of us trying to de-clutter our lives, but also cuts right to the heart of historic preservation. Join the colloquium for the morning lecture, or for the lecture, lunch and house tour—see above, or www.casafeliz.us, for details. Learn more about Sarah Susanka at www.notsobighouse.com. This entry was posted in Design Theory, Events, Seminars & Tours, Preservation and tagged Casa Feliz, house tour, lecture, winter park. Bookmark the permalink.